1Genetics and Molecular Biology Unit, Department of Animal and Environmental Biology, Abia State University, Uturu, Nigeria. 2Genetics Unit, Department of Botany, Obafemi Awolowo University, Ile-Ife, Nigeria. *To whom correspondence should be addressed. E-mail: solaibeh@yahoo.co.uk. Received 05 February, 2018; Received in revised form 09 March, 2018; Accepted 15 March, 2018. Allium cepa, Pharmaceutical effluent, Chromosomal aberration, Genotoxicity. There is a growing need to ascertain the mutagenic potentials of complex mixtures such as pharmaceutical industry waste waters. In this study, Allium cepa assay was employed to investigate the physico-chemical characteristics and genotoxic potentials of a pharmaceutical industry effluent. The inhibition of mitotic division was employed for in situ monitoring of cytotoxicity while chromosomal aberration analysis was used to evaluate genotoxicity. The results obtained show chemical oxygen demand (COD), biological oxygen demand (BOD) and certain metallic components such as Fe, Cu, Mn and Zn to be present in values beyond permissible limits by national and international regulatory bodies. 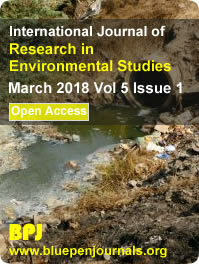 Analysis of variance (ANOVA) data revealed significant (p<0.05) dose-dependent differences in the mean root length of A. cepa exposed to various concentrations of the industrial effluent. An EC50 value of 2.1% was obtained, indicating the high toxicity of the effluent even at very low concentrations. The different types of chromosomal aberrations induced by the pharmaceutical effluent included stickiness, laggards and scattered/disoriented chromosomes; sticky chromosomes being the most frequent. These results draw attention to the dire need to characterize pharmaceutical effluents in order to determine the appropriate treatment options before they are released into the environment.